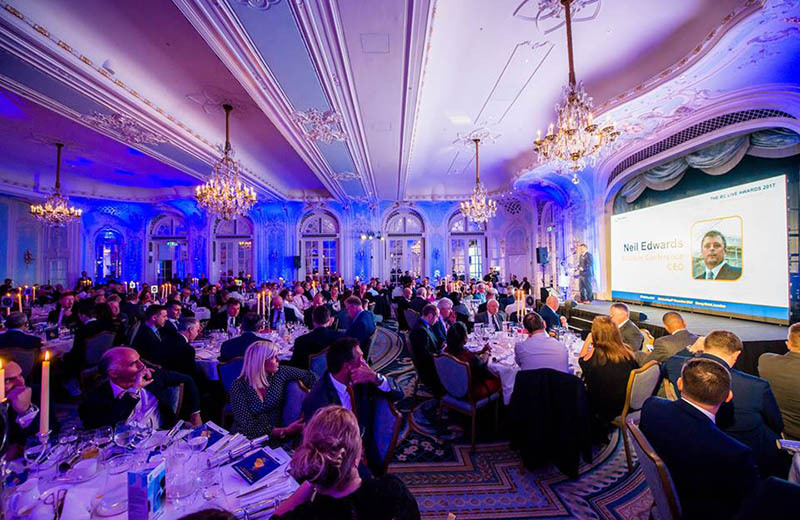 The winners of the BC Live 2017 Awards were announced yesterday afternoon at The Builders’ Conference annual Christmas networking event held in the beautiful ballroom of the Savoy Hotel, London. Superbly delivered by Connect In Events, the construction sector’s event management specialist, the afternoon followed a brand new format, giving the event a more vibrant and upbeat feel. Five new award categories were independently judged as well as the ultimate accolade for the Main Contractor who topped the BC Live League table 2017 for the highest value of contract awards secured in the year. The Builders’ Conference have traditionally held a ‘luncheon’ in December every year for the last 50 years and this year they decided to evolve the event into a one more focused on celebrating successes from right across the construction sector from innovation to supporting future talent through apprenticeship schemes. Also this year, the chosen charity was the Construction Youth Trust and the audience was interested to hear from Thomas Glover the Schools and FE Manager from the CYT who gave some really inspirational stories about the fantastic work the CYT do, encouraging young people to consider a career in construction and genuinely changing lives. 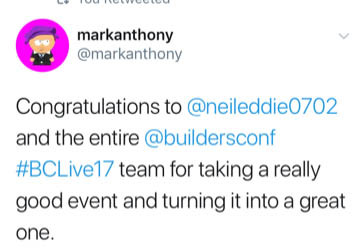 After a raffle and an impromptu auction, The Builders’ Conference are delighted to announce that the event raised nearly £2,300 for the Trust to support the brilliant work they do. The ceremony was hosted by BBC Broadcaster, Mike Shaft and the winners were presented with their awards by the sponsor of that category. Guest speaker Gerald Ratner was hilarious with his tales of the ‘mistake’ that led to the wiping of £500m from the value of his jewellery company overnight in 1991. He lamented that he was considered ‘unemployable’ for years but the audience was hanging on his every word and so pleased to hear about his current healthclub venture taking off. “All the team were excited about the new format this year and there is no doubt that Penni Pennington from Connectin helped by Nicola Dibb of Nicola Dibb Associates really put together a fantastic event. It was very slick and professional from the lighting and the music to the graphics and twitter wall. 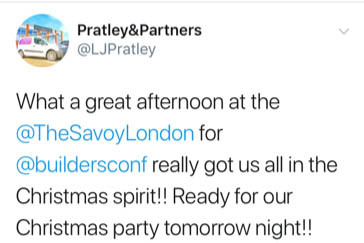 We have received some great feedback with many people enjoying the networking and saying it was an excellent kick off to their Christmas festivities. We hope that extending the awards categories will encourage more organisations to celebrate the successes across the sector and embrace the new focus the industry is receiving from the Government. I am very proud that it was such a fabulous event which also raised money to help encourage our future workforce through the Construction Youth Trust – we can’t wait to do it all again next year! For further information please contact Penni Pennington at Connect In Events on: 0161 871 8522 or [email protected]. The Builders’ Conference is the UK construction industry’s premier data provider, helping their members monitor, apply and win work everyday using our constantly updated database. 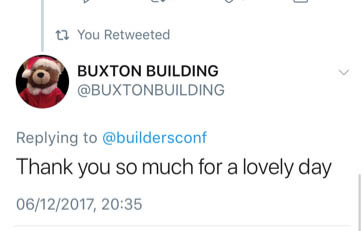 Any press enquiries about the Builders’ Conference should be directed to Nicola Dibb on 0208 770 0111. Any press enquiries should be directed to Penni Pennington on: 0161 871 8522 or [email protected].